Fast, reliable overnight delivery... Guaranteed! Currently commercial insects are primarily raised for rapid growth using the lowest cost ingredients. As a result insect diets do not contain the same ingredient makeup as wild insects would naturally forage for. Vita-Bug® insects have had their diet changed to increase their nutritional content to be more in line with wild insects. Attract more bluebirds and other insect eating songbirds with live Vita-Bug Mealworms! Not only do these mealworms arrive direct to your door alive and ready to feed, they're fortified with nutrients. That's because they're raised on a patent-pending feed proven to maintain increased vitamin and nutrient levels throughout their growing process. 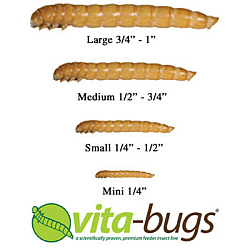 Unlike other live mealworms, Vita-Bugs are enhanced with Vitamin E, Beta-carotene, and Omega-6 and Omega-3 fatty acids. Simply place in your bluebird feeder to attract more songbirds. Vita-Bug Live Mealworms provide nutritional diversity and support a complete diet. They're an ideal treat for wild birds, reptiles, amphibians, and tropical fish. Promote enhanced immune response, coloration and improved overall animal health. Available in five sizes: mini, small, medium, large and giant (1-1/4" to 1-1/2"). Please specify desired size when ordering. Shipping - Orders are shipped via UPS Overnight Service only. Please select 'Live Insects/Worms Only (Overnight)' shipping method at checkout. Our mealworms are packaged to assure delivery in optimum condition.